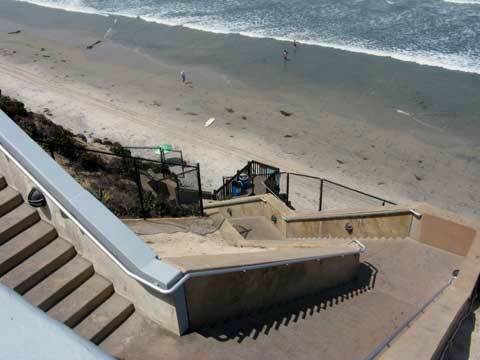 Stonesteps Beach is a quiet beach access to Leucadia State Beach in Encinitas, just south of Beacons Beach and north of Moonlight Beach. This is a nice beach for walking at low to medium tide. 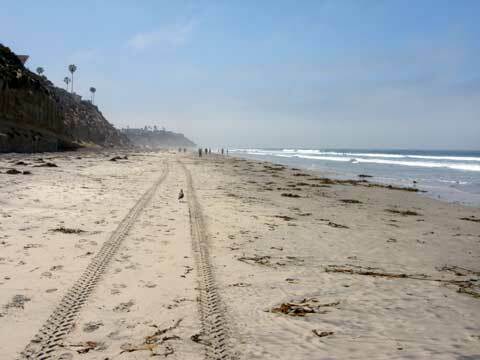 This remote beach access to Leucadia State Beach is popular with locals who like to walk along the beach at low tides. Stone Steps , as it name implies, has a steep set of stone steps down a steep cliff to a quiet stretch of beach. The surfers mainly use Beacons entrance in Encinitas, so this entrance is a little quieter. From the top of Stone Steps Beach, you can see a beautiful view of the Pacific Ocean. Getting There: Climb down the many stone steps to the beach from parking area. Things to Do: Walking, jogging, sunbathing, swimming, walk south to Moonlight Beach Encinitas or north to Beacons Beach at low to moderate tides. Things to See: Interesting mural, beautiful views, sunset over the Pacific Ocean, coastal erosion if you walk north or south along the beach at low tide. Facilities: Trash cans at top of steps. Services: None. Closest services to the south at Moonlight Beach Encinitas. High Tide Access: High tide (more than 3 feet) can block access north or south as you walk along the beach. Check the projected tides at San Diego tide table. Lifeguard: Lifeguards will occasionally patrol the beach in a jeep or truck. Hazards: Rip currents and steep cliffs. 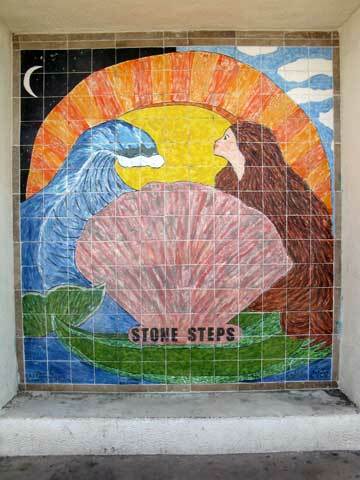 Stone Steps Beach Driving Directions - From Interstate 5 in Encinitas, take Encinitas Blvd. west for 0.5 miles, then north on Coast Highway 101 for 0.6 mile, then left onto El Portal Street, left on La Mesa Ave, and first right onto South El Portal St to 350 South El Portal. Park along the street as there is no parking lot. Parking is limited.